Today, my virtual book tour â€œ40 Blogs in 40 (Business) Daysâ€ finds me back in my hometown of Surrey to chat with Susan Emerson of Web Page Mistakes. Susan and I met virtually a few years ago as we share an interest in web accessibility – creating websites that are accessible to everyone, regardless of an individualâ€™s capabilities or the technology used. 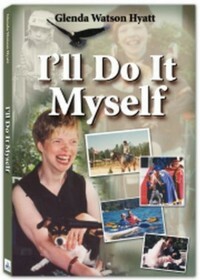 In my interview with Susan, I share how I had a fairly normal childhood, despite my cerebral palsy. My parentsâ€™ philosophy was “to introduce Glenda to the world and the world to Glenda”. In our home, the word canâ€™t was not allowed, only try. Please visit Susanâ€™s site to find out what other topics we discussed. Thanks Susan for taking time for chatting with me before leaving on your winter getaway. Enjoy the weather! Kicking off Summer Sojourn Virtual Book Tour in Style!